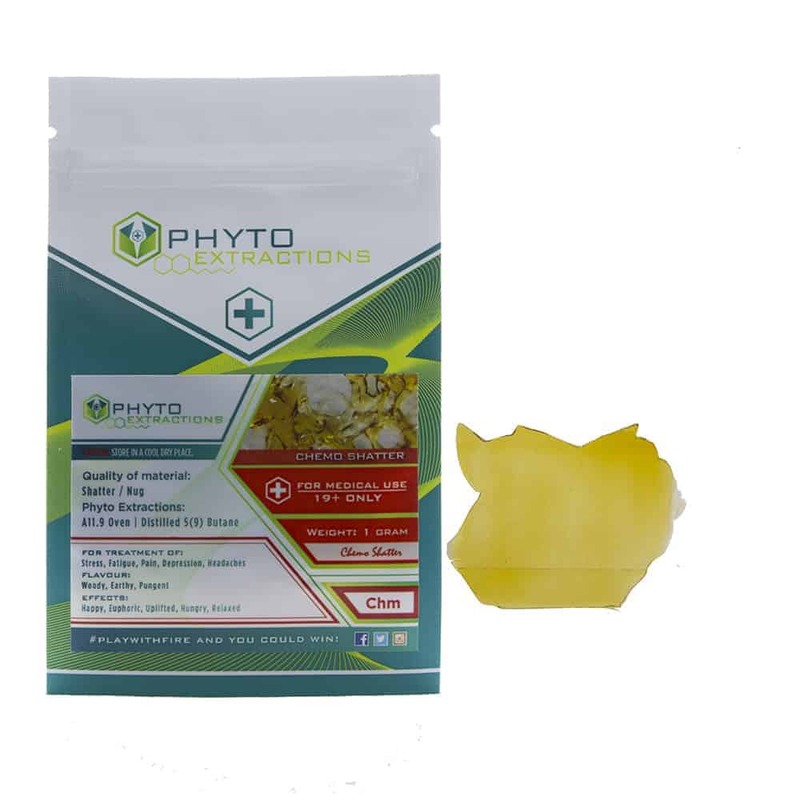 4 reviews for "Phyto – Chemo – Indica Shatter"
Really good! With phyto, always good but the Chemo was really clear and good to taste. I’ve been hearing about this strain for years. One of those almost mythical strains that people always spoke of with a slight tinge of awe in their voices and any one who had it was guaranteed to be able to get a premium no problem. So that being said I was pleasantly surprised to find the reputation of the strain wasn’t completely blown out of proportion. The deep mellow woodsy flavor had a slight lemon undertone that lingered on as a sweet after taste. The effects were very much as advertised. A deep couchy indica that relieved my back pain and gave me some serious munchies. Like when you were a noobie, where you raid the fridge to make the kind of snack no sober person would or could ever conceive of. As the effects progressed I found myself getting pleasantly sleepy and just kind of drifty and dreamy. The only thing I didn’t like was it made me feel a little too groggy if I overdid it. It comes on a bit slowly so you can get ‘one toke over the line’ 😉 kinda easily. Gold Buds… Wow! This strain is amazing! You guys always deliver on time, your discreet, prices are extremely reasonable, and I haven’t been disappointed yet. Chemo is now one of my favourite strains for insomnia. I took my first puff from my vape, and 15 minutes later I started to notice a really nice head high. Then my eyes started closing and I couldn’t open them again no matter how hard I tried. Plus, I could feel a goofy grin on my face… I was feeling good. LOL This strain is worth trying at least once no matter what your trying to combat. This strain is unstoppable! No one else but Gold Buds!